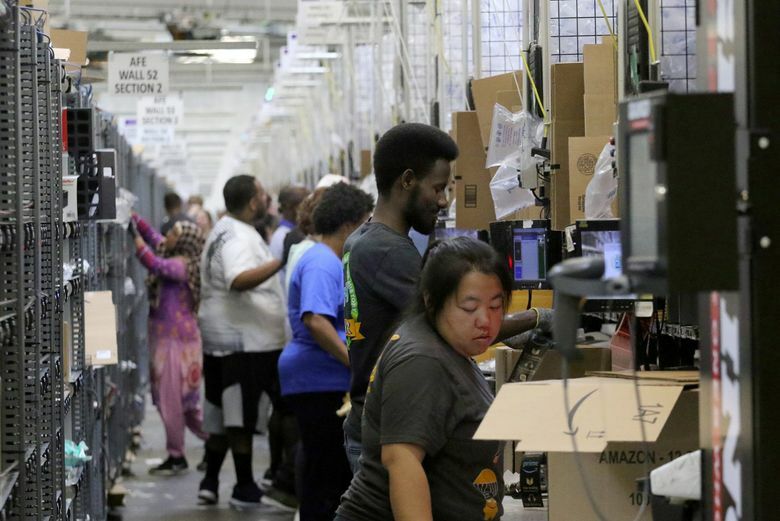 Amazon says it is offering raises to all hourly employees in its U.S. warehouses and call centers, a move that follows criticism of the pay and working conditions for the retail giant's lowest-paid workers. When Amazon this summer found itself under fire again for its treatment of the workers who pack and ship the products at the core of its retail empire, the company dug in its heels. An unsigned corporate blog, responding to criticism by Vermont Sen. Bernie Sanders, amounted to a full-throated defense of its workplace policies, and a rare public acknowledgement of outside critics from a famously quiet company. Five weeks later, the Seattle giant appears to have changed course, announcing the rollout of a $15-an-hour minimum wage for its hourly workers in the U.S., and a push to get Congress to raise minimum standards for all U.S. workers. The move follows criticism that the company was profiting from work done by low-paid workers even as founder Jeff Bezos became the world’s richest man. The new wage floor, which will take effect Nov. 1, applies to more than 250,000 full- and part-time employees who work in the company’s network of warehouses, logistics depots and customer-service call centers, as well as the more than 100,000 temporary hires the company plans to bring on to handle the holiday season’s uptick in orders. The plight of those workers has been a public-relations headache for the company for years, with media reports regularly describing grueling working conditions. Sanders in recent months added his voice to the criticism, targeting the company and its leader by name with legislation that would tax companies for the cost of food stamps and other federal assistance provided to their employees. Outside concern about the well-being of Amazon workers could threaten the company in myriad ways, close observers say, by diminishing customers’ willingness to shop at Amazon’s online bazaar, or risking a blowback from policymakers or regulators. The Seattle company’s practices have been under added scrutiny during the last year, as the company seeks a city — and its tax breaks — in which to locate a second headquarters campus. The company, the second largest U.S. employer behind Walmart, says it will also begin lobbying for an increase in the $7.25-an-hour federal minimum wage. Sanders said Tuesday that he hoped Amazon’s move would be “a shot heard around the world” that pushes other companies to increase their workers’ pay. Amazon’s minimum-wage announcement was made a little more than a month after the company vocally defended its compensation practices in the face of criticism from Sanders and others. In its response, Amazon said warehouse workers were paid an average of $15 if stock-based compensation and bonuses were included, but it didn’t break out the underlying hourly wage. Base hourly wages were lower, according to Amazon’s own job postings. Starting pay offered this year at more than 80 facilities in the U.S. averaged about $12.75 an hour, and as low as $10 an hour at some facilities in Texas and Florida. Amazon’s minimum-wage decision also comes as the company ramps up its temporary hiring to handle the holiday season’s jump in orders in an increasingly tight labor market. The national unemployment rate stood at 3.9 percent in August. Amazon didn’t say how many of its employees were making less than the new minimum. All hourly employees in operations and customer-service jobs, including those who made more than $15 an hour, will receive a pay bump in November, a spokeswoman said. The wage floor also applies to Amazon subsidiaries including Whole Foods Market, where workers advocating for better pay and benefits recently disclosed a push to form a union. While Amazon’s wage increase drew plaudits from national politicians, it was viewed as long-overdue by Seattle-area labor advocates, who successfully enacted the nation’s first $15-hour minimum wage nearly five years ago. The early push for a $15 minimum wage, which had struggled to take hold nationally in post-recession America, first found its footing in 2013 in SeaTac, where labor advocates ran a successful voter initiative to raise the minimum wage citywide. That same year, labor advocates took the idea north to Seattle, where it dominated the races for city council and mayor, and led, in 2014, to a phased-in $15 an hour wage in Seattle, the first large U.S. city to pass such a law. The success of Washington state’s two campaigns helped reignite efforts to raise the wage nationwide. Since then, workers have seen $15 wage wins in cities ranging from New York and Washington D.C. to Los Angeles and San Francisco, and statewide in New York and California. By contrast, efforts to raise the federal minimum wage, last raised in 2009, have gone nowhere. For the most common occupations in warehouses nationwide, including freight and stock movers and industrial tractor drivers, average pay ranges from $14 an hour to $17 an hour, according to Bureau of Labor Statistics data. For retail salespeople, the average is about $13. Some of Amazon’s rivals in retail, where employees predominantly work in stores in contrast to Amazon’s centralized logistics depots, have also boosted their starting wages in the last year or so. Target has said that it will increase starting pay to $15 an hour by the end of 2020. Costco this summer added $1 an hour to its pay, to as much as $14.50. And Walmart lifted its starting wage to $11. Amazon, which has been posting record quarterly profits, didn’t disclose the cost of the raises. Walmart said its raises would cost the company $300 million over the course of a year, while Costco said its pay bumps would cost at least $110 million. Amazon on Tuesday also set a new wage floor for workers in Britain, to 10.50 pounds (about $13.65) in greater London, and 9.50 pounds ($12.35) in the rest of the country. In a blog post explaining its wage plans, Amazon said it would also scrap its program that offers hourly warehouse and customer-service workers stock grants, which vest over a period of a year or more, replacing it by the end of the year with a program for employees to purchase stock directly through the company. Including the raise in base pay, the net effect is “significantly more total compensation for employees, without any vesting requirements,” the company said. And Amazon, whose warehouses tend to be highly automated facilities where employee productivity and work targets are closely tracked, proactively pointed out that there would be no such performance criteria to qualify for its new base wage. “No targets required,” the company said. Amazon shares fell 1.6 percent, to $1,971.31, on Tuesday. Seattle Times business reporter Paul Roberts contributed to this report.